Say you’re shopping for a new home, and you keep finding houses that are almost perfect. Maybe the carpets are old and need replacing; maybe the paint is starting to peel; maybe you need a handicap ramp installed; maybe the furnace is just a little too old. Maybe you’re checking out the REO or foreclosure and short sale markets and thinking that most of those homes need some work before you’d be happy in one of them. Those problems don’t have to be deal breakers. A 203(k) Renovation Loan can help you take care of those problems and turn a house that’s almost perfect into the home that’s just right for you! 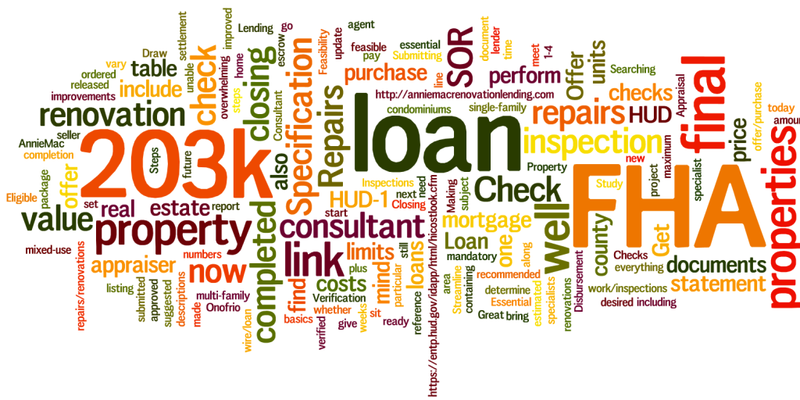 With a 203(k) loan, you can borrow money for repairs and upgrades in addition to your loan for the home itself, all bundled together so you only pay one set of closing costs and make only one payment each month for your financing. These loans are especially great for FHA properties, older homes and homes bought on short sale or at foreclosure — but any home can benefit from some remodeling or cosmetic fixes, to make it your own. I can explain the details of the program and provide you with guidelines to stick to while you look at houses with your real estate agent, making it easier for you to find a home that will qualify. Let’s talk about your goals, your budget and whether a 203(k) can help you get into a new home faster!